We’d love the opportunity to work with you for any contract or temporary, temporary-to-permanent or permanent needs you may have. With more than 200 recruiters across the country, we are confident we can help build your business through quality staffing and recruiting solutions. As a team-based firm, our recruiters are incentivized to find the best possible candidate for the role and your culture. Our team structure allows us to be agile and move quickly to respond to your needs whether it’s a short-term contract role or a direct hire position. Having been in business for nearly 20 years, we’ve developed an extensive network of candidates and placements who can vouch for the quality and caliber of talent we place and employ. Although we specialize in many different verticals, our expertise runs deep in each. Our recruiters know their space, and know it well. With a training group that ranks in one of the best 125 in the world, our recruiters are taught, developed and trained to be able to execute in the most efficient and successful way possible to help you find the talent you need to grow your business. Our recruiters have spoken at cyber security conferences, contribute to the American Marketing Association’s Journals, sit on the boards of their industry associations, and have taken certifications that demonstrate proficiency in their field. 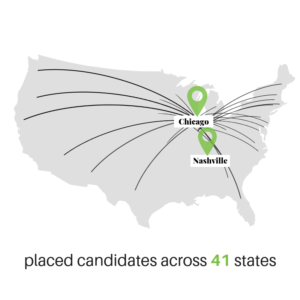 In addition, our team interviews more candidates in each vertical than anyone else in the industry. For all of these reasons our clients to continue to come back.